1. 1.2. Install Sigil (open source) software on Virtual Machine for training and eBook development. 2. 1.3. Load eBook source content (Word document) into Sigil. 2.1. 1.3.1. Is the file in MS Word Format? If no, proceed to step 1.3.2. If yes, skip to step 1.3.3. 2.1.1. 1.3.1.1. Be proficient in Microsoft Word and PDF document software. 2.2. 1.3.2. Export source file to Word document format. 2.3. 1.3.3.	Review the formatting to ensure layout was preserved through file exporting (conversion to MS Word). 2.4. 1.3.4. Import the Word document file into Sigil. 2.4.1. 1.3.4.1. Navigate back into virtual machine. 2.4.2. 1.3.4.2. Transfer Word document file into virtual machine using file transfer protocol software or email. 2.4.2.1. 1.3.4.2.1. Be proficient in using file transfer protocol software. 2.4.2.2. 1.3.4.2.2. Be proficient in using email. 2.5. 1.3.5.	Review the file to ensure no errors were introduced during import. 2.6. 1.3.6. Perform visual check of content to ensure there are no discrepancies from imported file. 3. 1.1. 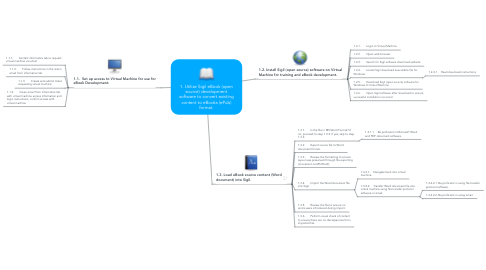 Set up access to Virtual Machine for use for eBook Development.